Are you author who has just a completed a book and are looking for a book publisher based in the Southwestern region of the United States of America. If so, take a look at the following 5 top book publishing companies in New Mexico. This Albuquerque-based publisher was founded in 1994 with a vision of providing nursing trainees and home health aides with educational resources and textbooks. Hartman pride themselves on thorough, caring customer service and implementing the users’ feedback into their new releases. All of the titles published educate on different aspects of caregiving: feeding and nutrition, home care, as well as nursing assistance. The educational catalogue targets not only private carers, but also staff developers, who can use the In-Service Education books to plan lessons and teach more efficiently. On a lighter note, Hartman publish inspirational memoirs written ‘by nurses, for nurses,’ to emphasise the value and dedication of hard working, caregiving staff. If you’re an author with the right qualifications and wish to publish with them, Hartman will be happy to hear from you. Visit the Become an Author section to learn how to contact the editorial department and what to include in your application or inquiry. Based in Santa Fe, the awarded Museum of New Mexico Press was founded in 1951 as the publishing limb of the New Mexico Department of Cultural Affairs. Since, the publishers’ aim has been to produce books of impeccable quality that proudly accompany the prized possessions and exhibitions held at New Mexico’s family of museums and art centres. Both visitors and residents of New Mexico have been enjoying what the Press has to offer for decades – the timeless design and craftsmanship, but also the content, which revolves around fine art, photography, nature, architecture and naturally also the regional folklore. One of the latest publications is an aesthetically pleasing book on the history of American jewellery through the centuries. MNMP titles are distributed both nationally and globally, therefore can be found in bookstores, larger libraries and, of course, museum shops. MNMP do not accept full manuscripts, but do review book proposals. A list of questions that the submission letter should answer, as well as further details, can be found here. If you’re passionate about the environment and making a change in the world we live in through written word, Synergetic is your kind of publishing. The ‘fiercely independent’ company was founded in Santa Fe in 1984 by Deborah Parrish Snyder, whose unchanged approach to creating global change is what drives Synergetic to this day. The topics published include environmental studies, ecology, psychedelics, sustainability, consciousness and poetry. Some of the latest releases include books and guides on Buddhism, ethnopharmacology and psychotherapy. The aim of Synergetic is to guide humanity towards better understanding of the planet we inhabit, as well as our role in the process. The international network of authors, who are true specialists in their fields, makes Synergetic’s catalogue extremely diverse and knowledgeable. Should you wish to submit your idea for a world-changing book to the publisher, it is best to email the publisher Deborah directly. You can find her contact details here. When considering the professionalism and panache of American University Presses, the one that has been publishing alongside the University of New Mexico since 1929 does not fall short of them. Based in Albuquerque, UNM Press is devoted to publishing scholarly titles that revolve, generally speaking, around arts and humanities, as well as natural and social sciences. The Press plays a significant role in the promoting of the state too, as they additionally produce popular, regional books. UNM Press has not only over a thousand of titles in print currently, but also distributes titles for local publishing houses. It certainly is well on its mission to make New Mexico recognised worldwide and showcase the academic talents through their published work. Prospective authors interested in manuscript submission are required to send an initial letter with a book proposal included. The list of editors and their subject areas, and well as detailed instructions, can be found here. Based in the sun-drenched Santa Fe, Terra Nova is an independent publishing producing titles from a diverse range of genres, with a focus on those that involve the Southwest or New Mexico. Apart from regional books, Terra Nova publishes within the area of health and wellness, as well as fiction, young adult novels and memoirs. They might be a company of small sizes, but they’re a mighty bunch, boasting a global reach, committed service and plenty of experience to make the ride smoother for both new and established authors. Good relationship with the readers is also cherished and maintained through monthly Eldorado Book Circle meetings, where authors can do readings, discuss and answer all the burning questions. Terra Nova is currently accepting manuscript submissions, especially those related to health, nutrition and regionality. Other areas are also considered. To learn more about the submission process, click here. 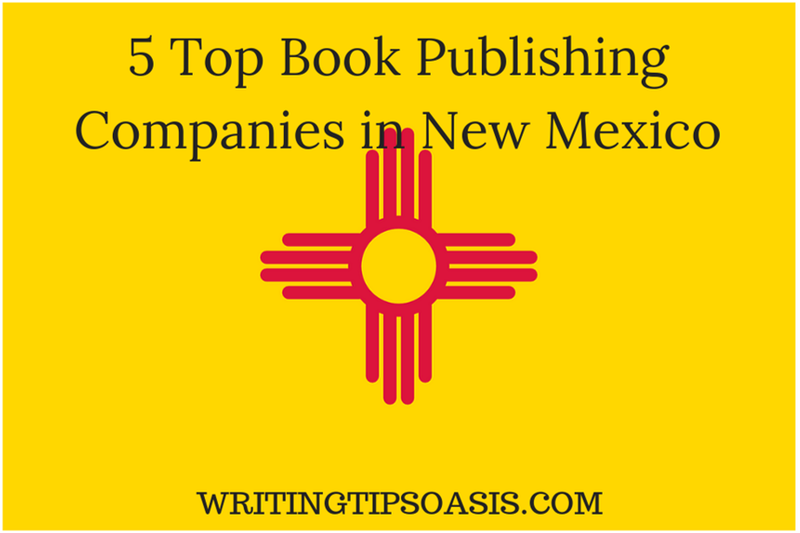 Are there any other book publishing companies in New Mexico that should be on this list? Please tell us about them in the comments box below!